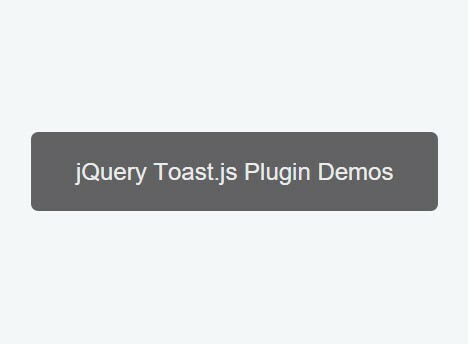 All the Free jQuery Plugins about 'toast message' are listed here. 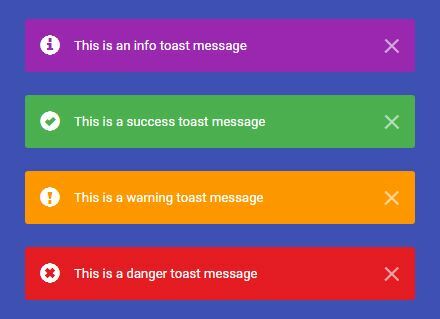 The jQuery Toast plugin makes it easier to create customizable toast-style temporary alert messages on the webpage using Bootstrap 4 toasts component. 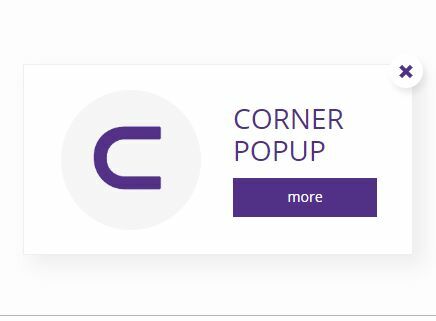 The Corner Popup jQuery plugin gives you a flexible, multi-purpose, and highly customizable popup box solution for modern web design. Toastr is a small and simple jQuery notification plugin used to display toast-style non-blocking messages that auto disappear after a specified timeout. 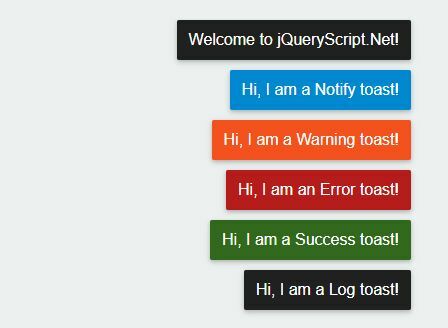 This is a list of 15 best toast notification jQuery plugins of 2018 that makes it simple to create and display Android style toasts in your web pages or web applications. jnoty is a small jQuery notification plugin which helps you create macOS-like Growl Notifications with varying themes (Success, Warning, Info, Danger) on your web app. A notification manager for jQuery for creating toast-like, non-blocking notification popups with countdown timer bars. Notify is a small jQuery notification plugin used to create Material Toast like notification messages sliding in/out from the edge of your screen. 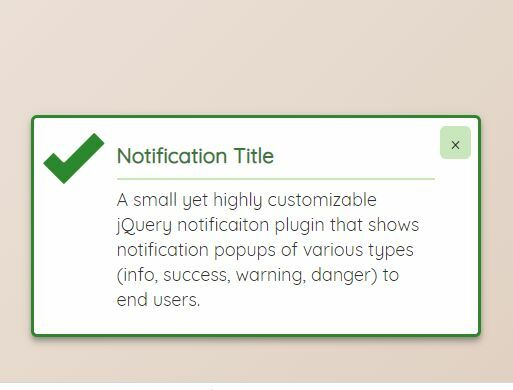 ggFeedbackMessages is a small yet highly customizable jQuery notification plugin that shows notification popups of various types (info, success, warning, danger) to end users. mobile-layer is a mobile-first jQuery popup plugin for creating iOS style loading indicators, toast messages, alert/confirm dialogs, top notification, action sheets, and scrollable pickers on the web app. Just another jQuery notification plugin to display informational/alert messages in toast-like, non-blocking, and highly customizable notification popups. 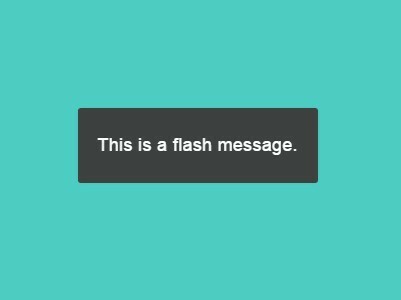 flash.js is a minimal yet customizable jQuery notification plugin for creating animated flash/toast messaging system to provide unobtrusive user feedback on the web application. nok.js is a cross-browser, extra-light (1kb minified) jQuery notification plugin to create toast- or growl-like info/success/error notifications on the screen. Toast.js is a small, simple, CSS-less, cross-browser jQuery toast notification plugin that you can determine how long the toast message stays on the screen. myAlert.js is a lightweight notification library for jQuery that makes it easier to create elegant, sliding, customizable notifications and alerts on the page. 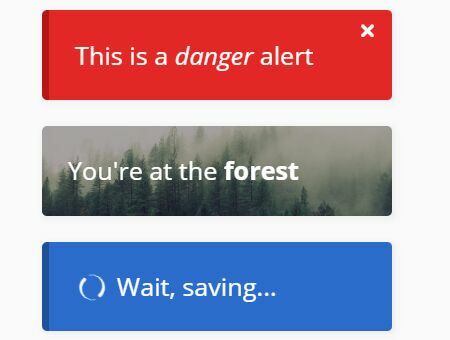 alert.js is a jQuery/Zepto plugin used to create mobile-friendly popup boxes that meet all your needs about confirm/alert dialogs and toast-style notifications. Pomelo Toast is a tiny jQuery plugin to create toast-like notification messages that stack one after another when there are multiple instances on the page. 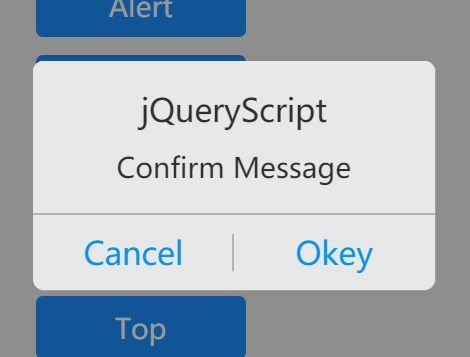 notify.js is a tiny, customizable jQuery plugin for creating toast-style alert and notice popups that fallback to bottom notification bars on mobile and tablet devices. 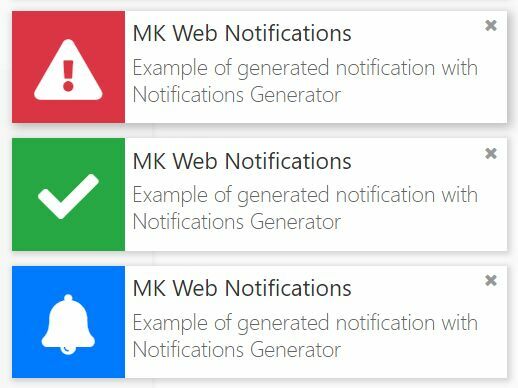 MK Web Notifications is a jQuery plugin used for generating Desktop Notification style alert and toast message boxes that slide in from the edge of your screen. mk-notiX is a very small jQuery notification plugin which helps you display growl-style toast messages to alert the user of something. A lightweight yet customizable, non-blocking jQuery notification plugin for creating permanent or toast (temporary) notification popups on top of the webpage. simpleToast is a small, unobtrusive yet customizable jQuery notification plugin to create minimal, clean, non-blocking toast popups on the web app. Info.js is a really small jQuery plugin to create toast-style, non-blocking, absolutely positioned notification messages on the screen. gg-notif is a jQuery notification plugin to create unobtrusive, auto-dismiss, CSS3 animated, Material Design inspired toast messages that are configurable via HTML data attributes. Message Toaster is a simple, lightweight jQuery plugin created for displaying unobtrusive, non-blocking, and highly customizable toast (temporary) notifications on the screen. 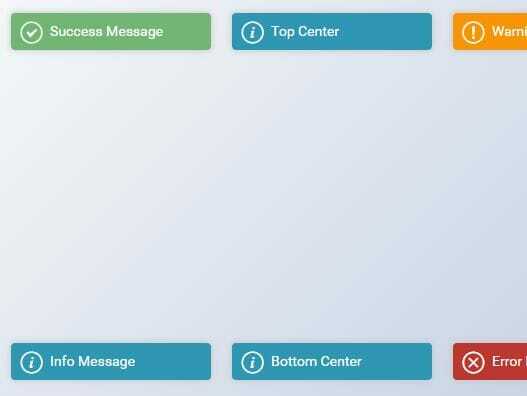 messageFlow is a small jQuery notification plugin used to create Android toast-style feedback messages with stackable and auto-fade capabilities. Toast.js is a lightweight yet customizable jQuery notification plugin which helps you create and display temporary or sticky toast messages like Android. Notify is a small, handy jQuery notification plugin which helps you create Android toast-like alert and loading popups with custom icons on the web page. toastJS is a really small, CSS less jQuery plugin used for displaying CSS3 animated, toast-like error/success/loading notification messages on your web app. A flexible jQuery plugin that lets you create Apple iOS style dialog popups for your mobile-first web applications. MyFakeToast is a really simple jQuery plugin used to create toast-like notification popups for your webapp that supports any html contents and auto hides after a given timeout. Toaster is a lightweight jQuery notification plugin which lets you create toast- and growl-style notification messages using Bootstrap alerts component. 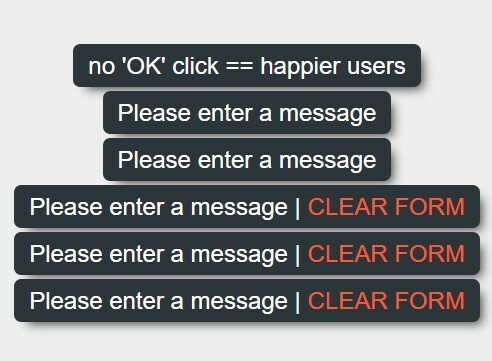 message.js is an elementUI inspired jQuery notification plugin used to create customizable info/success/error/warning feedback messages for your web applications. The Toaster.js jQuery plugin let's you create Material Design inspired, highly customizable, snackbar- & toast-like notification popups on the webpage. Just another jQuery material toast plugin used for creating temporary, stackable toast/alert notification messages that will destroy themselves after a specific timeout. Page Alert is a small and easy-to-use jQuery notification plugin which lets you display customizable, themeable, Android toast-like alerts on the webpage / web application. iToast is a dead simple jQuery notification plugin which helps you display minimal, clean, Android-style, auto-dismiss toast messages at the bottom of the screen. iao-alert is a lightweight, flexible, customizable jQuery plugin for creating animated, toast- or growl style alert notifications on the webpage. myMessage is a lightweight and simple-to-use jQuery plugin that lets you display Android toast style notification/alert messages with icon support on the webpage. ymzbox is a lightweight jQuery web popup plugin which lets you create various types of toast notifications, loading indicators and alert/confirm dialog boxes on the web applications. xl-toast is a super light (2kb unminified) jQuery plugin that helps you create highly customizable, Android style toast notifications using jQuery .extend() method. A simple tiny jQuery plugin which lets you create animated, clean-looking, draggable alert/confirm dialog windows, iframe modals and toast-style notification messages. 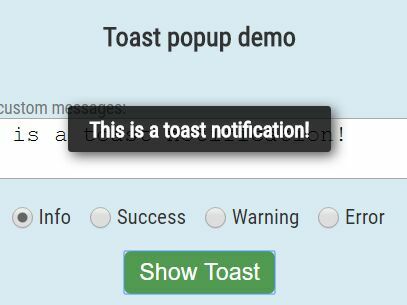 ztoast is a really simple and small jQuery plugin used to display 'Toast' style notification messages at the bottom right of the webpage. Modal.js is a versatile jQuery plugin which lets you create minimal clean modal windows, alert dialog boxes and toast-style notification messages on your web app. Floating Messages is a jQuery plugin used for displaying toast-style notification messages at the 'right bottom' of the webpage. 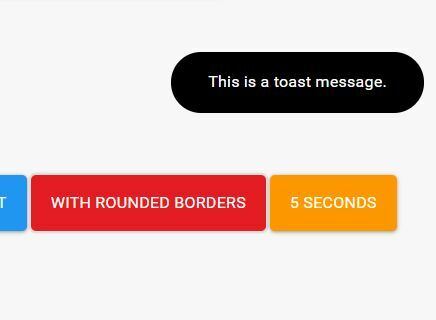 JTC-Toast is a tiny, cross-browser jQuery plugin for creating small toast messages & notifications on the webpage. 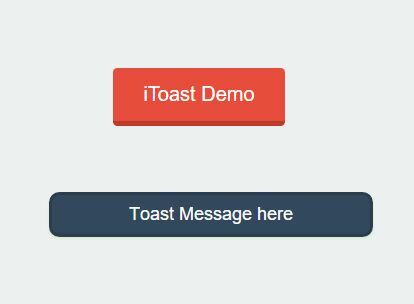 simpleToastMessage is a small jQuery plugin that uses plain HTML and CSS to display auto-close toast notification popups with variable colors on your screen. 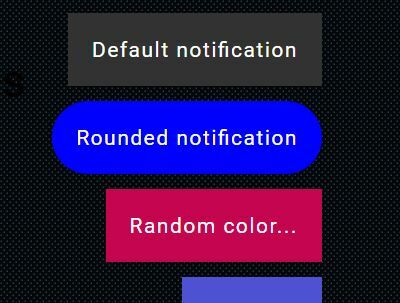 Toast.js is a jQuery plugin which allows to create Android / Material Design inspired, toast-like notification popups on the screen. ToastMe is a super tiny (1kb minified) jQuery plugin to show an Android style toast notification with a custom message which will be closed after a specific timeout. mgDialog is a simple, flexible jQuery plugin that helps you create multipurpose, highly customizable modal windows, dialog boxes and toast notifications. 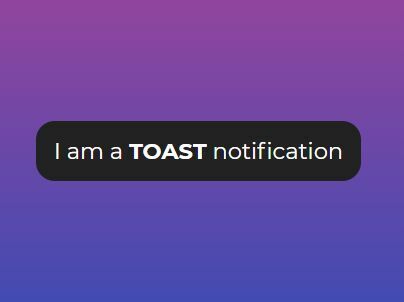 Toastem is a super tiny jQuery notification plugin which helps you show custom toast messages on your html page. 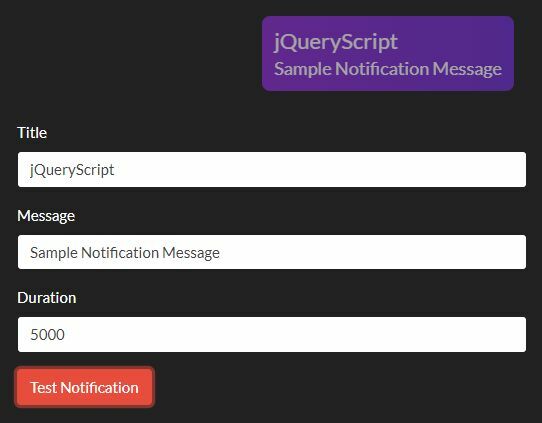 notify.js is a simple, flexible, customizable jQuery notification plugin which allows to show alert messages of various types to your end users. showToast is a simplest jQuery/Zepto based toaster that helps you display Android-style toast messages on the screen. hinter.js is a very small jQuery notification plugin which displays error and/or success toast messages on the top of webpage using Bootstrap styles. 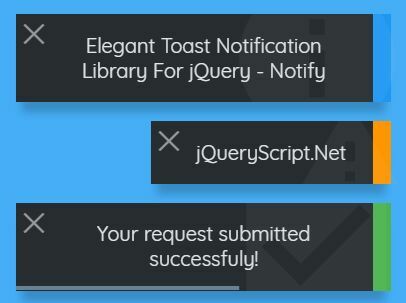 Just another jQuery toast notification plugin used to a toast notification like popup with a custom message which will be closed after a fixed time. bootstrapAlert is an easy to use jQuery plugin which helps you create Android toast-syle info/warning/success/danger alert popups using Bootstrap styles. Toastr is a simple yet robust jQuery toast notification plugin which lets you create highly customizable toast messages on your webpage. 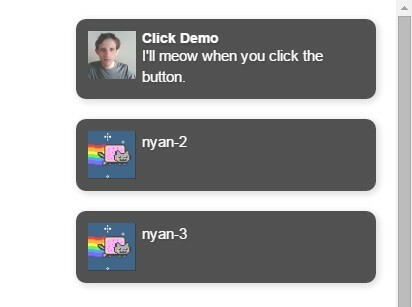 Bootstrap Purr is a jQuery notification plugin which utilizes Bootstrap's Alerts component to display customizable, draggable alert messages on your web page. 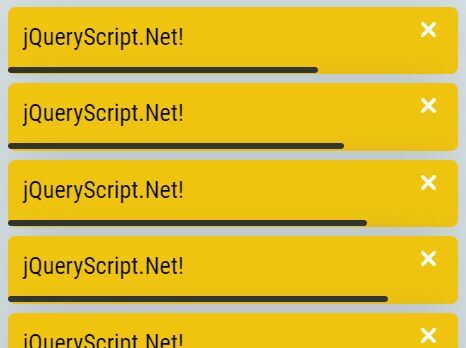 dreamAlert is a lightweight jQuery plugin helps you display Android toasts- or growl-like notification messages on your webpage or web application. Toastx is a very simple and CSS-less jQuery plugin used to show Android-style brief messages for your web application. 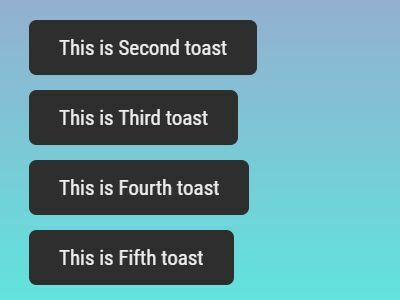 Material Toast is a super tiny jQuery plugin that shows Android style, customizable toast messages on the screen, inspired by the Google Material Design spec. Noti.js is a small yet customizable jQuery plugin used to display various types of toast-style sticky and/or temporary notification messages on the webpage. timed-message.js is a lightweight and easy-to-use jQuery plugin used for displaying toast-style non-blocking notifictions to alert the user of something. Flash is a simplest jQuery plugin used to display Google style toast messages while flashing the whole screen using CSS3 animations based on Animate.css. Toast.js is an ultra-light and easy to use jQuery plugin to show Android style toast messages with support for auto position, custom dismiss timeout and message queue. 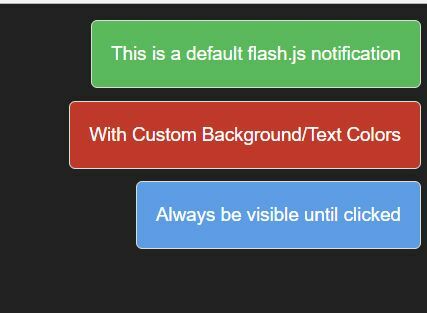 JNotify is a simple and flexible jQuery notification plugin that displays full configurable toast messages on your web page or web app. 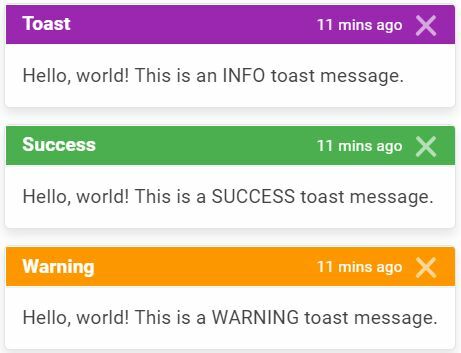 ToastJS is a lightweight jQuery based notification library used to display Google & Android style toast notifications that allow for queuing toast messages. eatoast is a tiny and simple to use jQuery plugin that creates Android-style toasts to display feedback messages in a small popup. Toast.js is a jQuery & jQuery UI plugin which allows you to display toast messages in a small & customizable popup as seen on the Android platforms. snackbarjs is a lightweight jQuery plugin to create Google Material Design style snackbars and toasts that automatically disappear after a timeout.